The inside story of how a trio of young entrepreneurs convinced billionaire Dan Gilbert to back high-speed Internet service in Detroit — and beyond. A few years back, nearly every city in America — big or small — was competing to become a test market for Google Fiber, the search engine giant’s foray into high-speed Internet service that was billed as 100 times faster than conventional residential speeds. In the end, Kansas City, Mo., took home the prize. But three young entrepreneurs who worked at Quicken Loans and Bedrock Real Estate Services in Detroit didn’t want to wait around to see if Google would add another city. In early 2013, they reasoned if one enterprising company could make a leap of faith, they could, too. They had the skill set and a ready market, but they lacked resources, a business plan, and an office address. For Randy Foster, Edi Demaj, and Marc Hudson, their combined talents were primed for a startup enterprise. Foster is an expert in network design and management, software engineering, and system administration. Demaj came up through the real estate sector, but had contributed to several tech launches with others, while Hudson’s background is in software design and engineering. The result of their effort will go online later this year in the form of Rocket Fiber — now part of the Quicken Loans family of companies, or, more specifically, a part of Rock Ventures. The service will first be offered in downtown Detroit for what Rocket Fiber says is the same price, or in some cases even a lower price, than what businesses and residential consumers now pay for Internet service. If the rollout in the central business district goes well, plans are to expand the service to Midtown next year. Long term, the goal is to grow the footprint throughout the city and into the suburbs. The infrastructure necessary to make Rocket Fiber work in downtown Detroit is less massive than most people may think. It starts with a 1,700-square-foot data center that can be expanded to 3,000 square feet. Eventually, a second data center will be needed. More crucial to the technology’s feasibility is Rocket Fiber’s commitment to bring the fiber to every commercial or residential building that will be using it. The use of fiber, as opposed to more traditional copper wires, facilitates higher speeds and more reliable service. As it stands, the Rocket Fiber trio says fiber doesn’t cost any more than copper does. A key to making that work is called the Next Generation of PON, or NGPON2. A PON is a passive optical network. It allows service from a single point to be delivered to multiple points by employing splitters so a single optical fiber can serve multiple destinations. The splitters used in a PON don’t require electrical power, making it affordable to take a signal from a single fiber and split it into 16, 32, or 64 fibers. 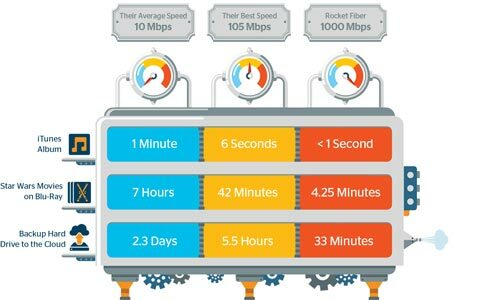 Rocket Fiber can make its service affordable too by splitting the fibers (it has the capacity to handle 40 gigabites of bandwidth), thus making it more feasible to route fiber directly onto the customer premises. Rocket Fiber’s use of fiber contrasts with the more traditional use of copper by legacy providers, which is why the co-founders believe it’s feasible to provide their service at the same cost — or possibly even less — than what current downtown service providers are charging. Competitively pricing the service isn’t only necessary to achieve market penetration, it’s also what Rocket Fiber thinks the business community will come to expect for premium performance. “You want to be able to upload a gig or get a gig (of data), and not have to pay $4,000 or $5,000 a month to get that service,” Foster says. The creators were confident they could make the technology work and that the downtown market was ready for it, but that didn’t mean getting Quicken Loans founder and chairman Dan Gilbert’s support was a slam-dunk. Foster, Demaj, and Hudson knew meeting Gilbert in person to pitch the idea would be possible, but it would require a considerable mix of hard work, serious thought, and nerve. “There wasn’t a lot of initial movement on the idea,” Hudson says. To break that loose, Hudson tested the limits of his own nerve as a relatively new Quicken employee. He sent an email to Gilbert to share the idea, and then sent a follow-up message when he didn’t get a response as quickly as he’d hoped. When Gilbert responded, he indicated that he liked the idea and wanted to know who could make it happen. The response was both a blessing and a challenge. The Rocket Fiber team was soon connected to Quicken’s Mousetrap Department, which is tasked with reviewing and improving internal processes. It also plays an important role in the development of new ideas. Christina Mathes, vice president of the Mousetrap Department at the time, says an idea that gets a thumbs-up means the work is just beginning. One of the challenges for the Rocket Fiber team was to develop a sound financial model. They knew they needed help, and fortunately they didn’t have to go far, knocking on the office door of the finance department at Quicken Loans. “We said, ‘We want to build this thing, and we have no idea what it’s going to cost,’ ” Hudson says. Before long, they were assigned a point person who took on the task of helping to develop the financial model. In the meantime, Foster, Demaj, and Hudson learned in May 2013 that a major national trade organization was having a conference in Kansas City that could give them great insight into Rocket Fiber’s prospects. Just as they were getting ready to leave for the conference, they got a surprise. Although that part of the ordeal was over, it was only the first of two presentations to Gilbert that would be necessary to establish Rocket Fiber as a genuine business entity. The next step was to conduct feasibility studies with various outside organizations that could help determine if the service would work as well in practice as it sounded in theory. The other overreaching question was: How profitable would it be? The team first concluded that, if nothing else, developing the technology would benefit Quicken Loans, which provided a solid impetus to keep moving forward. The big test, however, was whether Rocket Fiber, as its own entity, could develop, market, and provide the service to other businesses, along with residents. 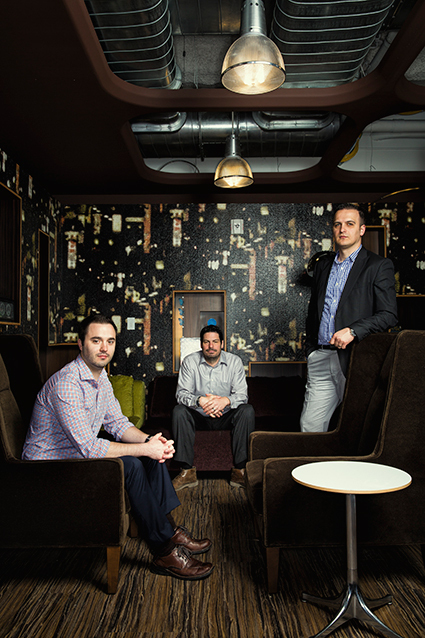 Before they could get final approval from the company’s executive leadership — and from Gilbert — to launch the service, the trio had to complete their homework. “We studied the demographic profiles of the (market) area. In the fall of 2013, the three of us spent a lot of time after hours getting probably a lot more versed in financial modeling than any of us cared to do earlier in our lifetime,” Hudson says. As they gained more confidence that the venture could work, backed by research, they began consolidating their support at the highest levels of the company. Today, the company has 13 full-time employees, along with five interns, who are working feverishly on the planned launch along with an assortment of vendors, including equipment providers and network provisioning suppliers. The thought of lightning-fast Internet connections is certainly appealing for the user who knows the frustration of waiting for images and videos to load, or for Web-based applications to function as designed. But does it really make sense for businesses to cut ties with existing providers to save what will, in many cases, be mere seconds? Hudson says the difference will especially be important for innovators looking to develop new ways of doing things on the Web. Along with rolling out the service later this year, the company plans to reach out to various neighborhoods to find out where there’s interest. That may include town hall-style events where they can explain how the technology works and receive input from businesses and residents about their level of interest in signing up. There’s no question that much of the motivation for Rocket Fiber is to give downtown Detroit and its districts and neighborhoods a technology edge that could seriously aid in the city’s comeback — something very consistent with Gilbert’s investment strategy to date. Of course, Detroit is far from the extent of Rocket Fiber’s vision. Eventually, communities throughout Michigan will be targets for expansion as they express interest and the capital-intensive nature of the venture allows for the infrastructure to be put in place. To the extent it may seem surprising that an alternative to Google Fiber would come from Quicken Loans, the co-founders emphasize that Quicken and Rock Ventures have always considered themselves technology companies first. Above all else, they look for business opportunities wherever they might make sense. For those unfamiliar with the term, a unicorn refers to a tech company that has started in the past decade and has reached a market valuation of $1 billion or more. Uber and Airbnb are examples of the nearly 40 unicorn companies that are now spread throughout the country. There are no companies like them headquartered in Detroit. Rocket Fiber believes that’s partly because Detroit has not, up to now, featured the type of tech infrastructure that would permit such a business to thrive. “To attract a company that scales into a unicorn would be the pinnacle for Rocket Fiber in Detroit,” Hudson says. Of course, before that happens, Rocket Fiber has to win customers, many of whom they will need to draw away from existing Internet service providers. And while the technology itself might seem to be a clear competitive advantage, it’s often something as simple as customer service that makes the difference when buyers choose a provider. Mathes, since named vice president of client experiences, knows Rocket Fiber needs to excel in that area. Can Rocket Fiber make the difference that will allow downtown Detroit to attract the kinds of businesses that need hyper-fast bandwidth? Can something like Rocket Fiber really bring in the type of organizations that can get it to unicorn status? The kind that can revolutionize the whole idea of Detroit’s economy?